The Folkestone Calais Eurotunnel route connects England with France. The crossing operates up to 49 times each day with durations from around 35 minutes. 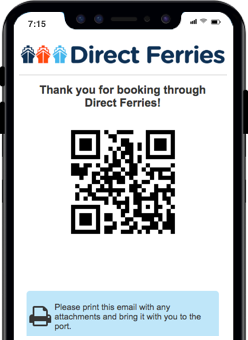 Folkestone Calais journey duration and frequency may vary from season to season so we’d advise doing a live check to get the most up to date information. 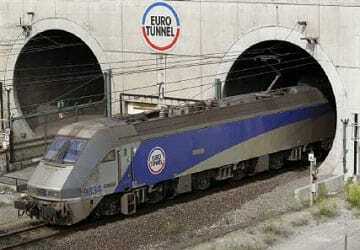 Get your cheap Eurotunnel tickets from Folkestone to Calais today. Prices shown represent the average one way price paid by our customers. The most common booking on the Folkestone Calais route is a car and 2 passengers. folkestone to calais Quick access everything and caught the earliest train. But came back from calaiis to Folkestone morethan 2 hours waiting in quiue because the member of staff who board in the train made a mistake by order. any way train is quick and fast. Thanks for reasonable fares. "Return trip Engalnd to France 18-08-16 to England 2-08-16"
Very efficient. Well priced. Staff very helpful. Would recommend and use Eurotunnel again in the future. Did not use catering facilities so cannot comment. The town of Folkestone is located on the south east coast of England in the county of Kent. Located around 70 miles to the south east of London, Folkestone has a small port and is easily accessible by god road and rail links. A major landmark in the town is The Leas, which are cliffs that are located above the town's beach. Also in the town, visitors will find a Mertello Tower which is a small defensive fort that was built in the 19th century and stands on the cliffs above Copt Point. The tower was principally constructed as part of England's defences against Napoleon but has since had several other uses. It has been Coast Guard lookout, a family home, a golf clubhouse and a World War II mine control post. Today, the tower is a visitor centre. Located just outside of the town is the southern end of the Kent Down Area of Outstanding Natural Beauty which is a haven for walking, cycling, horse riding and nature watching. The small harbour at Folkestone is mainly used by fishing and pleasure boats with cross channel ferries having stopped using the port in 2000. The English end of the Channel Tunnel is located at nearby Cheriton. The French city of Calais is located in the Nord-Pas de Calais department of north west France and is the closest port in France to England. The Strait of Dover, which lies across the English Channel on the UK mainland, is around 32 km from Calais and on a clear day the famous White Cliffs of Dover can be seen from Calais as can the Calais coast from the cliffs. Calais has been an important maritime hub for commerce and tourism between France and England for many years and the town itself is divided into two parts. The old town, Calais-Nord, is located on a man made island that is surrounded by canals and harbours. The modern town, St-Pierre, is located to the south of the old town. The city is moving away from just being home to the busy port and is becoming increasingly popular as a tourist destination in itself. It has a long and rich cultural heritage, a number of museums and a lively nightlife. A popular attraction in the city are its Belfries which are siege towers that were built to protect the city from marauders, and are today declared a UNESCO World Heritage Site. 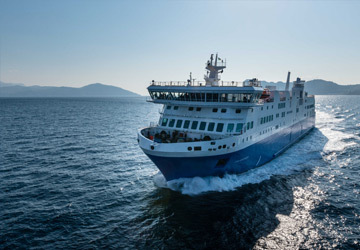 Ferries to England depart Calais on average every 30 minutes, with a crossing time to Dover of around 75 minutes.